Drift Boat fishing on the Salmon River can be a very exciting and productive way to spend a day. 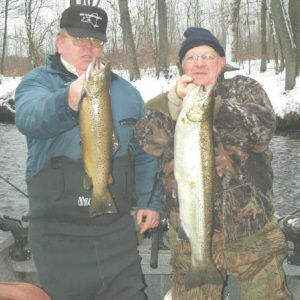 Having always wanting to give it a go Raymond Martin of Elmira, NY and Jim Cleary from Big Flats NY took and drift boat trip down the Salmon River with Shane Thomas of Gottum Guide Service. There is more to drift boat fishing than one would imagine. The flow of the water the water temperature and coloration are all factors that must be considered. Shane worked very hard to make their trip a success. He would stop ahead of each spot and pick the appropriate type and size of lure for the water conditions. He would test each lure in the water and tune it if necessary. Each lure would receive a hook sharpening to make sure they were razor sharp. Flatfish, Hot Shots, and Kwikfish of various sizes and colors were the main plugs used. Once all the lures were tuned and sharpened we would let the lures out and place the rods in the holders. Then we would inch down the river with all 5 rods out over the front of the boat presenting our offerings to the fish. The beauty of a driftboat is you can row back up stream and present the offerings to the fish several times. Sometimes a strike would be savage from a fish defending its territory other strikes would be subtle from a fish looking for a quick meal. Either way you will know it when that rod bends over and the fish takes to the air in an attempt to throw the hook. Certain sections of the river that are not fishable with plugs but still have fish holding in them would require them to stop and fish with flies or egg sacs. When the fish are not moving much and seem lethargic flies and egg sacs will often tempt fish that would not hit a plug. When wading the river be sure to use corkers these are metal cleats that attach to your boots. The rocks on the bottom of the river at flat and very slippery. Fishing the Salmon River is a experience of a lifetime. The river holds the NY state record for Chinook Salmon. This fish was caught by Kurtis L. Killian on a orange fly from the Salmon River September 07, 1991 this awesome fish weighed an amazing 47 lb. and 13oz. The river is also known to give up many steelhead over 20 pounds each year. All of this fantastic fishing is made possible by the Salmon River Hatchery, located in the Village of Altmar in Oswego County. It is here that the DEC will collect the eggs of the migrating Atlantic Salmon, Chinook Salmon, Coho Salmon, Brown Trout, and Steelhead. The Salmon River Hatchery produces about four million trout and salmon each year. If you are interested in buying a drift boat here is a link of used drift boats for sale. Another option is to buy a drift boat kit and build your own. 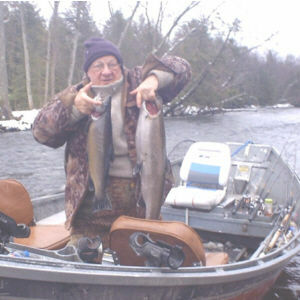 Building your own drift boat is a good project to keep any angler busy during the winter months.